Chasing gym dreams means spending endless hours in the gym followed by measuring macros. Whether your goal is the beach, stage or increasing athletic performance, male and female alike shoot for the stars! 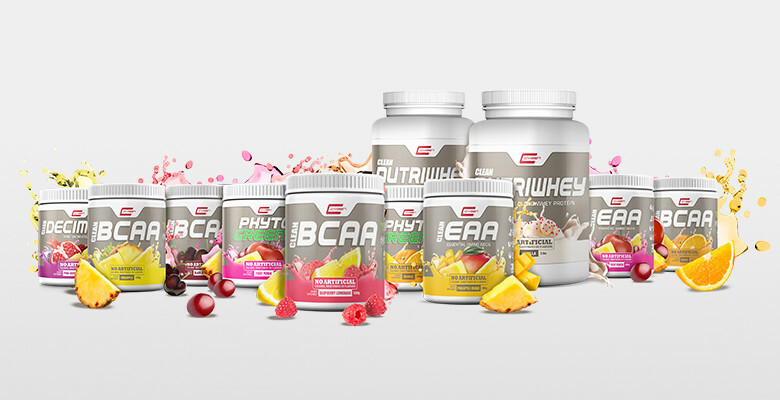 Sports supplements offer an edge BUT at what price? Do you know what’s lurking in your favorites? Building and repairing muscle requires awesome aminos while thermogenic aids fight stubborn fat. Would you be surprised if your daily scoop is toxic? Most supplements are flavorless chalky powders. Artificial sweeteners mask the flavor while vivid color quickly connects the brain to the ‘natural’ flavor intended. Synthetic color is certainly cause for concern. Adding artificial color to enhance taste is nothing new. Ancient Romans used saffron spice while Aztecs favored the cochineal insect. Sadly, natural color was replaced. The first synthetic food color, mauvine was invented in 1856 to enhance imitation and poor quality food. It doesn’t appear much has changed. Canadians will find synthetic colors listed by a name on their products whereas the United States lists the specific color followed by a number. Be a savvy consumer and learn both! There are 5 key colors that dominate sports supplements. Red #3 or Erythosin is a coal-tar derivative commonly used for candy and gelatins. Research reveals possible gene mutations, cancer and changes in brain chemistry. Until further testing brings more evidence, it remains on the safe list. Red #40 or Allura Red AC is the most widely consumed color, replacing the infamous cancer causing Red #2 in 1976. Hyperactivity, as well as allergic reactions are common complaints. The jury is out as to whether Allura red may cause Cancer. Time will tell. Blue #2 or Indigotine is a coal-tar derivative. This potential allergen causes tumors at the injection site in animals. It’s on the safe list but the World Health Organization rates it Category B or questionable for use in food. Yellow #5 or tartazine is notorious for good reason. It’s linked to migraines, ADD, thyroid issues and lupus. It’s well known for causing immediate reactions for those people sensitive to salicylates. Suffer from asthma? Better to avoid all together. Yellow #6 or Sunset Yellow is linked to liver stress, swelling of skin, upset stomach and potential toxicity yet somehow still considered safe! Think green is safe? Think again. Yellow #5 or tartazine is combined with blue to create your ‘green apple’ flavor. Sadly, supplements have another scary secret! Sweetness without calories is amazing but the cost to health is high. Artificial sweeteners are chemicals combined in a laboratory our body can’t process. They flow through the blood stream, polluting along the way. They eventually accumulate in organs, causing damage. They may be responsible for sleep disruption, sexual dysfunction, cancer, lupus, MS, diabetes and ironically enough, weight gain. Synthetic sweeteners aren’t worth the risk. 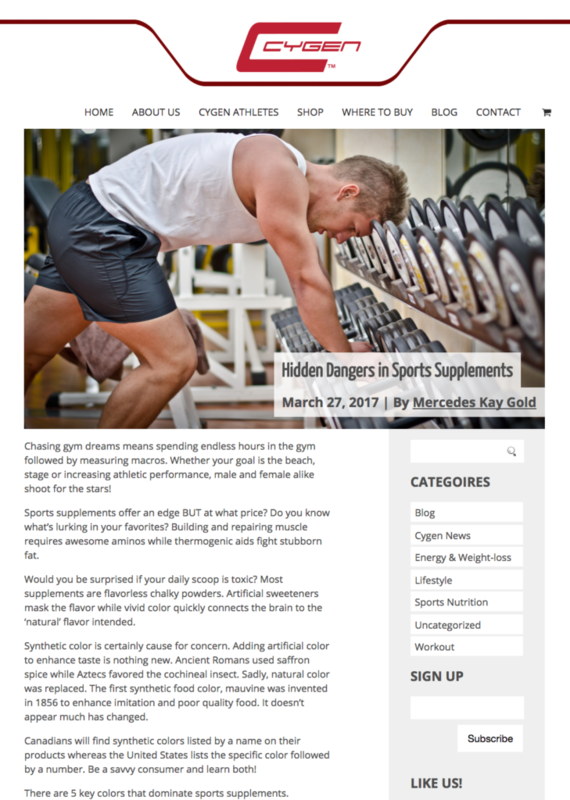 The sports supplement industry relies heavily on two inexpensive sweeteners to mask their products. Sucralose and Acesulfame Potassium are both approved for use by Health Canada. According to their website, artificial sweeteners “are subject to vigorous controls under the Food and Drug Act and Regulations.” Does that make them safe enough for long term consumption? Neither sweetener has been on the market long enough to know without a doubt, long term implications of extended use. Let us not forget saccharin was once the gold standard. Sucralose is essentially chlorinated sugar. You may recognize it as Splenda. It’s not so splendid! Sucralose is derived from an unnatural chemical bond resulting in a sugar at least 600x sweeter than nature produces. Sucralose is produced by replacing three chemical groups in sugar with three atoms of chlorine. Chlorine deletes the thyroid of iodine, disrupting the endocrine system and negatively impacting metabolism. Sucralose is calorie free because it’s not metabolized. How can that be? Mutated molecules just cruise past all SEVEN major organs in the digestion system without accumulation, absorption or harm? No, 11-27% of sucralose is absorbed by the GI tract. Could this explain stomach cramping, bloating, diarrhea, bladder infections, blood in the urine, kidney problems and lower backaches listed as complaints by sucralose lovers. Dr. Joseph Mercola, renowned heath lecturer adds dizziness, migraines, blurry vision and weight gain to the list. According to the Canadian Diabetes Association, the amount of sucralose that can be ingested over a lifetime without any adverse effects is 9mg per kg of body weight per day. The average serving of sucralose in any given sports nutrition product ranges between 70-90 mg. Consuming diet colas, water flavor boosters or gum may have you reaching your daily maximum value. Acesulfame Potassium or Ace-K is next on the list. It was approved by the FDA in 1988 but Canada waited until 1994. By 2003, it found mainstream use. Ace-K is a potassium salt, containing methylchloride, a known carcinogen. This sugar wanna-be is 200x sweeter than sugar. Like other sweeteners, it’s not metabolized leaving it essentially a zero calorie sugar substitute. Ace-K on its own has a distinct bitter metallic taste and therefore often paired with old school sweetener aspartame. If you suffer from Phenylkenoturria you must avoid. One study, found animals given Ace-K developed breast and lung tumors. In another, diabetic rats experienced a rise in cholesterol. Nausea, headaches, mood problems, mental confusion as well as liver and kidney cancer have all been associated with Ace-K consumption. The Canadian Food Inspection Agency requires sweeteners to be declared in the list of ingredients. It’s unclear for consumers how much sugar is required to produce an equivalent degree of sweetness. One thing is for sure. Sweeteners trick the brain into believing it’s sugar. Dopamine, feel good hormone is released, quickly triggering cravings for more. One teaspoon of artificial sweeteners equals a staggering amount of sugar. It’s time to love your insides as much as the chiseled exterior.Don’t be a guinea pig. Pass on lab creations. Rethink nature. Sweetness and beautiful colors decorate the planet. Choose supplements that contain stevia! Choose products that are colored with beet root, paprika, carrot, saffron, chylorphyll, cucurmin and tumeric! 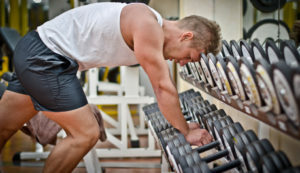 Kill yourself in the gym, not slowly with toxins found in sports supplements!